" var calculator_row = "
Metrie Complete® Pre-Painted Shiplap is the perfect product to help you transform a room in just one weekend. 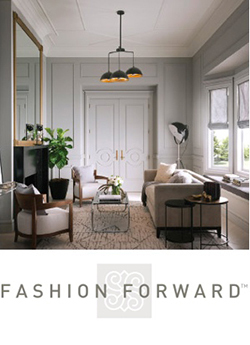 The shiplap boards are already primed and painted a Polar-White color, perfect for any decor scheme. Thereʼs no paint prep, or paint to clean up—just install and youʼre done! 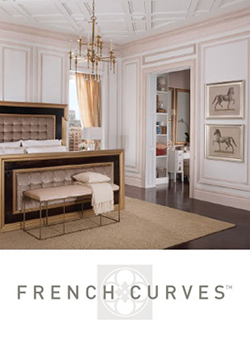 We teamed up with Roxanne West, of Bonjour Bliss, to create a beautiful feature wall. Check out her DIY process below. 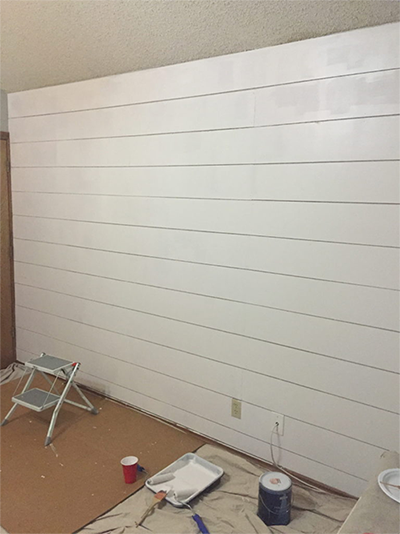 Follow these simple steps to get your shiplap feature wall installed this weekend! Using a STUD FINDER, locate the studs along the wall and mark them with a pencil. Then, use a LEVEL to draw a vertical line following the studs up the desired installation wall. Use an exacto knife and run along top of baseboard to sever existing caulking from wall. Use crowbar or equivalent tool to pry baseboard from wall. Pry from location of the studs to not damage drywall too much. Remove adjoining baseboard using same method as above on adjoining walls – mark studs with a dot using a pencil (erase when project is finished). Using a NAIL GUN (18 or 23 gauge), nail product to wall on the studs (using the marked lines from step 1). Repeat the process until this step is finished. Make cuts where necessary using a COMPOUND MITRE SAW. PRO TIP: for limited seams on a feature wall, when cutting a board to adjoin it along the same line, cut it at a 45-degree mitre with the angle facing away from the predominant viewing location. 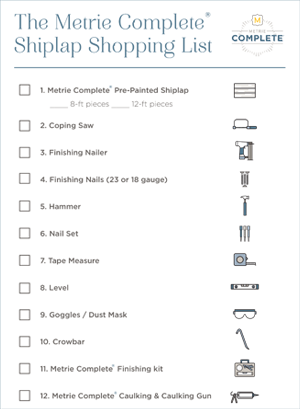 Use the color matched METRIE COMPLETE® WAX STICK or PUTTY JAR to fill all nail holes. Ensure the wax stick is slightly warm and the tip is clean when using, and ensure fingers are clean if using the putty jar. Use the ABRASION PAD to smooth all areas you filled. Use the color matched METRIE COMPLETE® CAULKING (caulking gun required) to fill any gaps along the adjoining walls (where the product meets the wall). Run clean finger down the bead of caulking to smooth out the caulking. 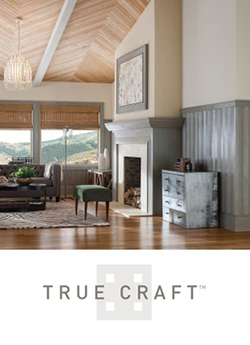 Metrie Complete® Pre-Painted Shiplap is 5.21 inches wide, and comes in 8 foot and 12 foot pieces*. 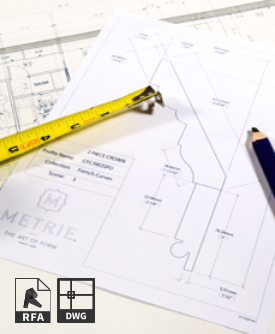 After you choose the location for your feature wall, measure the length and width of the wall and input your measurements below. We’ll tell you exactly how much product you’ll need to buy to get the look. Your total above includes the recommended addition of 10% to account for product lost during cutting. Metrie is not responsible or liable for the accuracy of this calculator. Any user of this calculator takes full responsibility for independently verifying the accuracy of calculator results. Purchasing Tip: Divide the total linear feet above by 8 or 12 depending on your desired shiplap length to get the total number of shiplap pieces needed to complete your project. 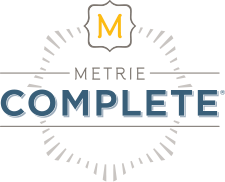 Find Metrie Complete® Shiplap near you! 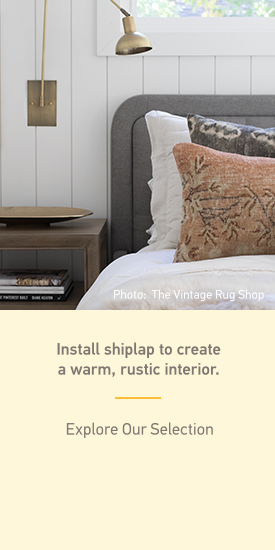 Weʼve got the full list of everything youʼll need to create your Shiplap feature wall. Enter your email below to download the list and head to your Loweʼs store listed on the map above to get everything you need. When using the Metrie Complete Finishing Kit (wax stick, caulking) do you need to paint over those to match color? No. 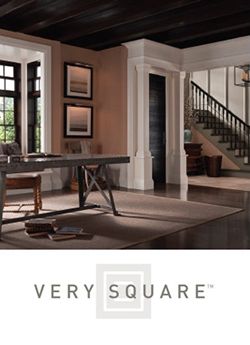 Metrie Complete is a pre-painted solution and the wax stick, caulking, and putty are color matched to the product. Simply apply the product within its application and apply the finishing kit solutions where needed. No painting is required on the Metrie Complete Shiplap product. It is a pre-finished solution that is ready to be installed. When do I use the Metrie Complete wax stick? When do I use the Metrie Complete caulking? Use the caulking where products meet the drywall (not the floor or carpet) to create a seamless look. Using a utility knife, use the guidelines on the tip of the caulking tube to cut the tube open. Insert the tube into a Caulking gun (not provided). We recommend practicing on a piece of cardboard if you have never used a caulking gun before. Can Metrie Complete be painted a different color? Yes. Although Metrie Complete is pre-painted, should you choose to change the color, you can! You will need to prepare the surface before painting by using a fine 120 grit sand paper followed by regular painting procedures. What happens when my Metrie Complete products gets dirty? 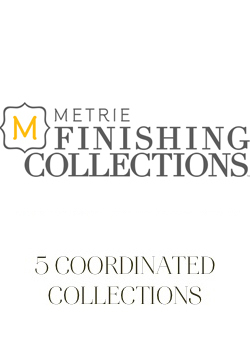 One of the best qualities of Metrie Complete is that it is pre-painted with a durable, high-quality finish; making it super easy to wipe clean with a non-abrasive cleaning agent and clean cloth. 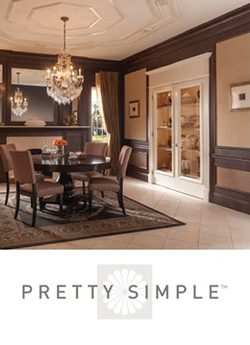 Have more questions about Metrie Complete® Shiplap? POST YOU METRIE COMPLETE® SHIPLAP FEATURE WALL ON INSTAGRAM FOR YOUR CHANCE TO WIN A WEEKEND FOR TWO IN NEW YORK! If you love a good DIY project, then you’re going to flip for our Metrie Complete® Shiplap Contest! The Grand Prize Winner will get a weekend in New York for two including roundtrip airfare, a 3-day, 2-night stay in a chic AirB&B, and $500 AmEx giftcard. The runner-up will get their choice of a tool belt or satchel from Chip & Joanna Gainesʼs Magnolia Market. All entries must be received by 11:59 pm EDT on September 1, 2017.